We Have Porchetta for Breakfast | Sprezzatura, Y'all! I have a few friends who will understand this. One in particular. 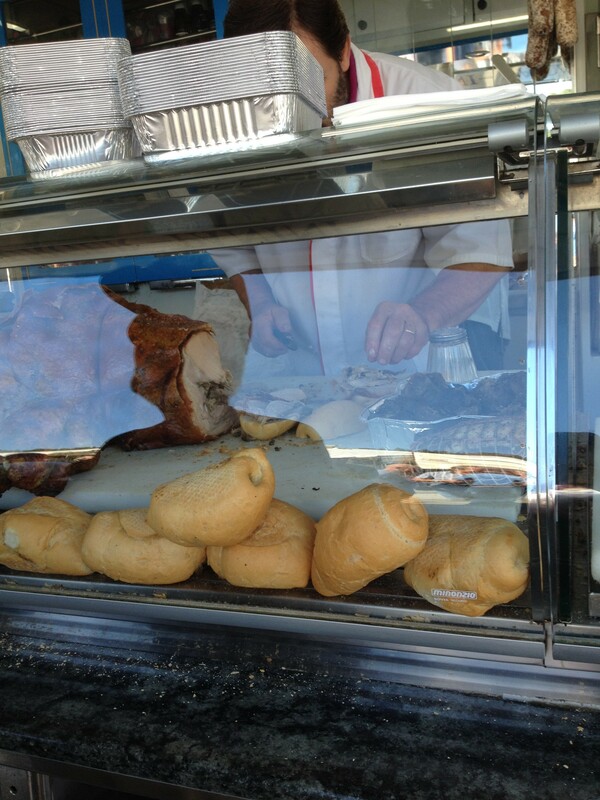 Yesterday was Sunday and that can mean only one thing: porchetta at the Monterchi market. Since I’ve vowed to have one every week I’m here, I couldn’t miss this. Here’s the problem: If you don’t go early enough, they sell out. So you really can’t have it for lunch. So yesterday, I woke up and set my sights on the porchetta and had no breakfast, just some tea. Not a piece of fruit – nothing. We had some errands to run yesterday, so we had to get going and Monterchi was our first stop. It’s really turning into fall here, so yesterday we took the top down and drove around in the convertible. Oh, what a difference a few degrees make! We had the windows up and the top down and decided that was a better scenario than having the windows down and the top up. Something about wind speed and drag and velocity, but it was much quieter and much, much more pleasant. What a grand time we had riding through Tuscany with the top down, with the view of everything all around us. The Tuscan sun (thanks, Frances Mayes) was shining down on us and the colors were all brilliant. Millie the dog was perfectly content in her back seat with her fluffy yellow pillows to roost on. But back to breakfast. At about 10:30 we had the porchetta panini. And a bottle of water. It was delightful. It was delectable. It was the perfect breakfast for a Sunday drive through Tuscany. I once had red beans and rice for breakfast in New Orleans. There was just not enough time to eat everything and I had to have the red beans. It was one of the most memorable meals of my life. It was my last day there and was made by a wonderful woman who happened to be one of my best friend’s mother. There, in her kitchen, on my last morning in New Orleans, she made red beans and rice for me and my friend. This porchetta was like that day when I had red beans for breakfast in New Orleans. Not quite appropriate, but oh so very right. Love you, Glo! Thank you. Please keep reading and let me know what you think. Would have loved to have joined you in all your activities this day! Top down, porchetta for breakfast! Perfection! It was perfection! You don’t need much more than that. Wish you were here!!! !